Iranian Revolutionary Guard Corps Navy Houdong guided missile boat. 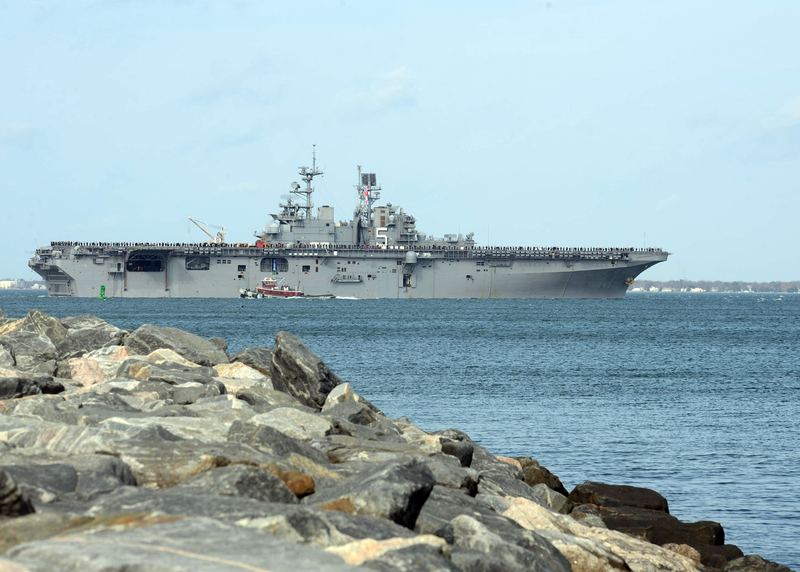 THE PENTAGON – Three U.S. Navy ships and a Marine helicopter were harassed during a night transit of the Strait of Hormuz on Tuesday, U.S. 5th Fleet officials told USNI News on Wednesday. 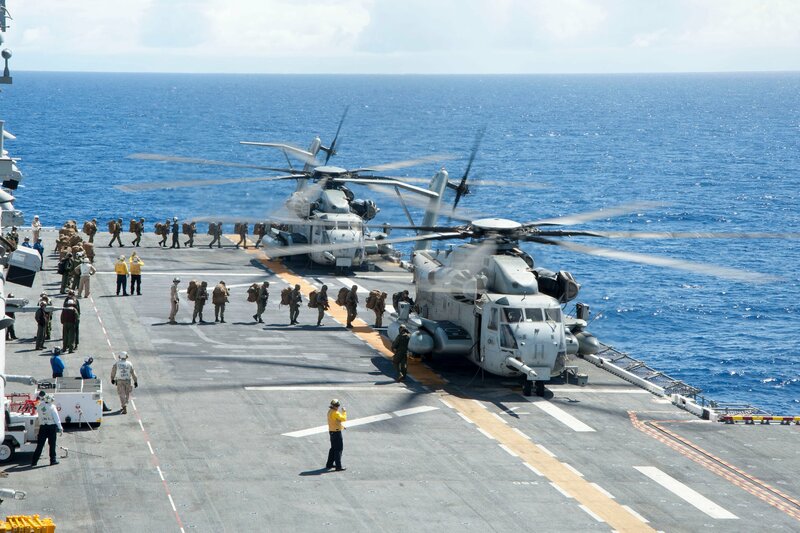 Marines assigned to 2nd Battalion, 3D Marine Regiment board two CH-53 Sea Stallion helicopters on the flight deck of amphibious assault ship USS America (LHA-6) as part of Rim of the Pacific 2016. US Navy photo. A Navy official confirmed to USNI News that the laser shined by the Iranian Navy vessel triggered the CH-53’s countermeasure system. CBS News first reported the encounter. The incident follows an encounter in March in which Iranian Revolutionary Guard Corps Navy patrol boat stopped short in front of the surveillance ship USNS Invincible (T-AGM-24) in March. In January, the guided-missile destroyer USS Mahan (DDG-72) fired three warning shots to ward off four armed IRGCN attack boats coming at the ship at high speed. In 2016, IRGCN had several high profile run-ins with U.S. Navy ships in the Persian Gulf. The following is the complete U.S. 5th Fleet Statement. Three U.S. Naval ships and a U.S. Marine Corps helicopter had an unsafe and unprofessional interaction with an Iranian Navy vessel while transiting the international waters of the Strait of Hormuz, June 13. The amphibious assault ship USS Bataan (LHD-5), guided-missile destroyer USS Cole (DDG-67) and dry cargo ship USNS Washington Chambers (T-AKE-11) were transiting the strait when the Iranian vessel paralleled the U.S. formation, shining a spotlight on Cole. Shortly thereafter, the Iranian vessel trained a laser on a CH-53E helicopter that accompanied the formation. The Iranian vessel then proceeded to turn its spotlight on Bataan, scanning the ship from bow to stern and stern to bow before heading outbound from the formation. During the interaction, the Iranian vessel came within 800 yards of Bataan. Naval Forces Central Command assesses this interaction as unsafe and unprofessional due to the Iranian vessel shining a laser on one of the formation’s helicopters. Illuminating helicopters with lasers at night is dangerous as it creates a navigational hazard that can impair vision and can be disorienting to pilots using night vision goggles.